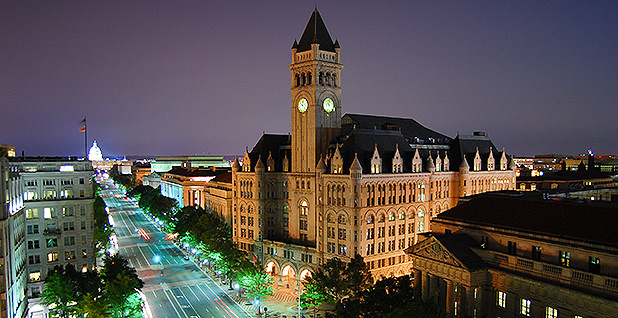 The General Services Administration inked a deal late last year to spend nearly $600,000 to continue operations at the Old Post Office Tower inside the Trump International Hotel Washington, D.C. — enough to keep the site open for up to a year in the event of a continuous government shutdown — according to newly released documents. The funding agreement between GSA and the National Park Service, which provides interpretive programming at the 270-foot observation tower, was included among 772 pages of documents released by NPS under the Freedom of Information Act. The documents provide new details about the Trump administration's decision to reopen the NPS site inside the president's namesake hotel on Pennsylvania Avenue, even as his demands for billions of dollars to fund a border wall triggered a 35-day partial government shutdown that closed national parks and other public sites (Greenwire, Jan. 2). Emails among NPS officials show discussion about whether the site — which is owned by GSA and operated by the Trump Organization under a 60-year lease that began in 2013 — would remain open ahead of the partial government shutdown that began in late December. "We will tidy up our operational plan with the management team here. We need to look more closely at Old Post Office tower operations in particular," wrote Jennifer Madello, NPS's chief of administration for the National Mall and Memorial Parks, in a Dec. 17, 2018, email to acting Regional Director Lisa Mendelson. Tim Moore, NPS's supervisory park ranger for the Pennsylvania Avenue National Historic Site, also asked about staffing for the site in a Dec. 16, 2018, message. "I know this sounds like a broken record but I really need to know what the plan is for OPOT if there is a shutdown," Moore wrote. "Currently I'm the only staffer on the OPOT account, so if we are going to stay open there needs to be process approved and vetted by HR for who is declared essential to stay with me to keep the tower open." An NPS spokesman did not immediately respond to requests for additional information for this article. Another exchange released by NPS shows that unidentified "GSA management" sought to reopen the building as early as Dec. 27, 2018. "I just spoke to GSA management and they asked if you were to be funded, how soon could you start services again at OPO?" wrote Darryl Speller, GSA's National Capital Region supervisory building manager, in an email. Although the Old Post Office Tower did briefly close after the shutdown began Dec. 22, the site reopened in early January with an infusion of funds from GSA. The agency previously indicated the money was provided via its Federal Buildings Fund, the money generated from rent paid to GSA (E&E News PM, Jan. 11). Contracts between GSA and NPS indicate the facility cost about $48,000 per month to operate, and GSA approved two agreements that would have funded the site through April at a cost of more than $288,000. Communications among NPS staff also show the agency's staff attempting to avoid getting "sucked into" questions about the site, given its ties to the president and his business. After E&E News first reported GSA's decision to fund the Old Post Office Tower's operations during the government shutdown, NPS personnel received numerous emails from other news outlets. Many asked about the role of the Trump International Hotels in the decision. "Seems to me this is GSA's to respond to, since it's their property and the decision to reopen it was theirs. I don't want to get sucked into a question about the political implications," wrote Mike Litterst, NPS's chief of communications for the National Mall and Memorial Parks. A spokesman for Trump International Hotels did not respond to repeated inquiries about the Old Post Office Tower site for this story or previous stories. NPS officials also reminded staff at the site to avoid speaking with reporters after the Associated Press quoted a park ranger working at the Old Post Office Tower in early January. "The ranger quoted in the story shared this with me and said the reporter didn't identify herself until they were finished chatting" Litterst wrote in a Jan. 5 email. "The quote is innocuous and isn't related to the shutdown, but we've reminded the staff to be extra careful about what they say when talking to visitors."